Robert A. Garcia first joined the Santa Fe County Sheriff’s Office as Undersheriff on February 11, 2003. He was appointed after retiring from the Santa Fe Police Department where he served 23 years as an Officer, Detective and Sergeant. Robert Garcia was elected as Sheriff by the citizens of Santa Fe County in the November 2, 2011 election and began his first term January 1, 2011. Robert is a former Police Union President and a United States Army Veteran. Originally from Questa, New Mexico he has lived in Santa Fe County for 31 years. Robert served in both the New Mexico and Texas National Guard. He is 55 years old and is married to Christine Garcia, an Education Technician with the New Mexico National Guard. Robert and Christine have 7 children and 12 grandchildren. Sheriff Garcia believes in serving the citizens by implementing community policing programs and improving employee morale. He has been instrumental in the Sheriff’s Office DWI program, which has been seizing cars of repeat DWI offenders. The program has also increased the number of DWI traffic officers patrolling the streets from two to six officers over the last three years. Sheriff Garcia has been instrumental in bringing technology to the Sheriff’s Office by placing computers in the patrol cars and making more information available to the public through email, text messages, web alerts and the Sheriff’s Office website. April 1975 – Joined the U.S. Army and served four years of active duty stationed in El Paso, TX assigned to the 3rd Armored Cavalry Regiment. After leaving active duty he joined the Texas Army National Guard and enrolled in the El Paso Community College taking courses in Criminal Justice. May 1980 – applied and accepted a Cadet position with the Santa Fe Police Department (SFPD). At that time, he transferred to the New Mexico National Guard. He continued his education at the Santa Fe Community College. During his service with the SFPD he served as a Patrol Officer, Community Relations/Crime Prevention Officer and in Fleet/Maintenance Management. While in the Investigations Division, he was assigned to Juvenile Services (Crimes against Children and crimes committed by children) and adult crimes investigations. He was also assigned to the Professional Standard Unit including background investigation for police applicants and hires, police misconduct, citizens complaints, tort claims, lawsuits, officer misconduct and staff inspections on department compliance with the Commission on Accreditation for Law Enforcement Agencies (CALEA). His final position was as a Patrol Sergeant where he was a Supervisory Patrol Officer in the patrol field from 2000 through 2003. In March of 2003, he retired as Patrol Sergeant with the SFPD and was appointed by Sheriff G. Solano as his Undersheriff of Santa Fe County. As Undersheriff, he was responsible for assisting the Sheriff with managing all operations of the Sheriff’s Office. He was directly responsible for managing the annual budget of approximately $10 million and has ensured the best use of taxpayer dollars during this time. November 24, 2010 – appointed interim Sheriff through December 31, 2010 by the Board of County Commissioners. 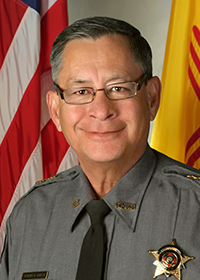 January 1, 2011 – took office for his first term as Sheriff of Santa Fe County.